Once upon a time there were animals. Once upon a time there were a shark, an elephant and a rhinoceros. Once upon a time... and then, how did it go on? Yes, long ago, in a faraway land there were sharks. Can you remember, the sharks? More than 10 per hour today are killed, mainly for the fins. And what about elephants? Can you remember them? From January to December in 20 thousand. 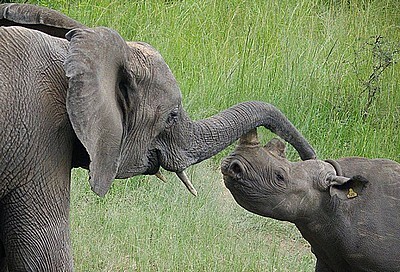 One every 25 minutes, at this moment, are being slaughtered for ivory. The rhinoceros? Do you remember those wonderful creatures? More than 1000 every year in South Africa alone. Almost 3 per day are drowned, now. The same happens to many other species and measuring the horrible extermination in human terms it is as if from 1970 we had lost the entire population of Asia. Once upon a time, there were a shark, an elephant and a rhinoceros. A long time ago, in a faraway land.